Each year The King’s Church host a Christmas meal at The King’s Centre where we gather together with our friends and neighbours from the local community to celebrate Christmas together. 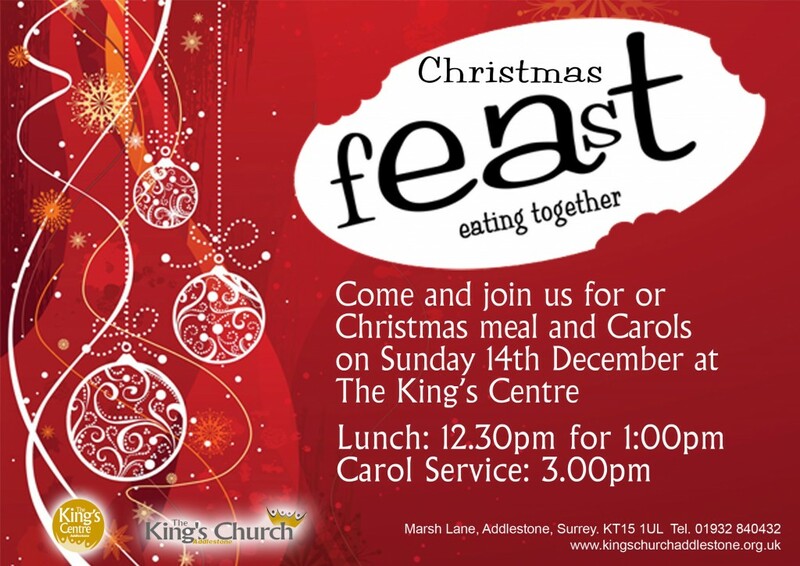 This year our Christmas fEAsT will be on 14th December, 12:30 for lunch at 1:00, followed by carols starting at 3:00. All are welcome to come! The Christmas fEAsT works along the same lines as our regular monthly fEAsT meals in that the idea is that every who comes pitches in to help and contribute. So please feel free to bring some food with you, or come along early to prepare, set up and decorate, or stay behind afterwards to clear up. It all adds to the fun! If you’d like more information drop us a line or call the office on 01932 840432.